Direction Sense Test - Verbal Reasoning Questions and Answers with solutions or explanation for interview, entrance tests and competitive exams. Practice online quiz, fully solved examples with detailed answers. Here are the different types of Direction Sense Test Verbal Reasoning Questions and Answers that are asked in the various competitive exams. Direction Questions are essential for the competitive examinations point of view. So, we are providing the Direction Sense Test Verbal Reasoning Online Test on this page. The competitors can take part in the Direction Sense Test Verbal Reasoning MCQ Quiz to know the questions along with the explanation. All the applicants can understand the tips to solve the Direction Sense Test Verbal Reasoning Questions with the help of this page. Direction Sense Test Verbal Reasoning Questions are asked in various SSC and Banking examinations like SSC CGL, SSC CPO, IBPS PO, IBPS Clerk, etc. In the banking exams, one or two questions related to this Direction Sense Test topic will be asked. Direction Sense Test Questions check one’s sense of directions and ability to visualize. So, the candidates need to practice the below given Direction Sense Test Verbal Reasoning Quiz. By this, the aspirants can know how to solve the questions at the time of the examination and can know the tricks to answer the Direction Sense Test Verbal Reasoning Questions. To solve the Direction Sense Test Verbal Reasoning Questions first, the applicants need to sketch the data provided. With the help of the below-provided explanation to the questions, the students can understand the tips to answer the questions. Without fail, the contenders need to practice the Direction Sense Test Verbal Reasoning Quiz which is arranged in this article. Direction Sense Test is a very important topic of the Reasoning aptitude tests. Therefore, all the competitors need to know all the questions related to the Direction Sense Test Verbal Reasoning topic. Directions Sense Test Questions asked in the examination are based on two principles 1. Distance and 2. Direction. The aspirants are to be asked to calculate the distance or the direction. The foremost one that the students are supposed to do is draw the basic direction map with the indication of all the directions. Based on the direction map, the applicants can quickly answer the Direction Sense Test Verbal Reasoning Questions. Practice the provided Direction Sense Test Verbal Reasoning Quiz and learn the questions. Along with this current page, the students can check our home portal @ allindiaexams.in to prepare for the examinations. 1. Two buses start from the opposite points of a main road, 150 kms apart. 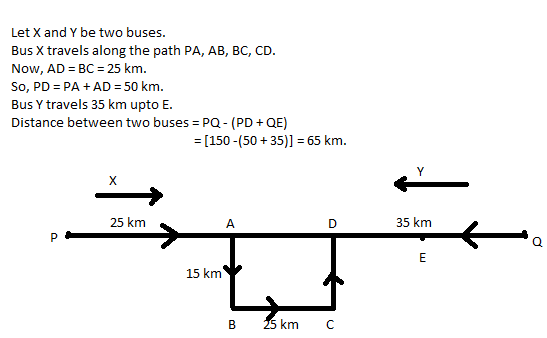 The first bus runs for 25 kms and takes a right turn and then runs for 15 kms. It then turns left and runs for another 25 kms and takes the direction back to reach the main road. In the meantime, due to a minor breakdown, the other bus run only 35 kms along the main road. What would be the distance between the buses at this point? 2. X and Y start moving towards each other from two places 200 m apart. After walking 60 m, B turns left and goes 20 m, then he turns right and goes 40 m. He then turns right again and comes back to the road on which he had started walking. 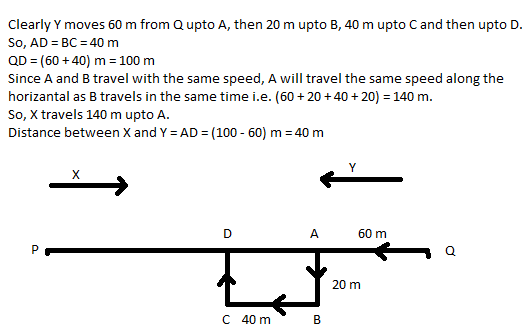 If A and B walk with the same speed, what is the distance between them now? 4. A is 40 m south-west of B. C is 40 m south-east of B. Then C is in which direction of A? 5. There are four towns P, Q, R and T. Q is to the south-west of P, R is to the east of Q and south-east of P, and T is to the north of R in line with QP. In which direction of P is T located?